My brain was chanting that the moment I saw it. btw i disagree with your comments. Haha, I have a feeling I know that Inazuma guy in your sig from PSOBB JP. He was...spirited. You cracked a smile at my burger delivery. Rose-Arachnid? Alright, I'll tell Pork who is leading the thing, I guess? I just happened to make a relatively appropriate name. No, we haven't, I don't think. Thanks for the add. Your name sounds familiar. 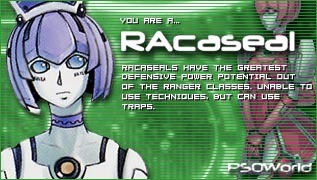 too bad I can't take all my gunner gear to PSO2......hahaha just kidding PSU can stay dead.